Wiki Education’s technology team is consistently updating the Dashboard to run more smoothly and to better suit the needs of the thousands of people who utilize it. As part of our mission to improve its open source code in a sustainable way, we engage young developers in contributing their own improvements to the Dashboard. If you’re interested in learning more about our mentorship program, read Director of Technology Sage Ross’ reflections on running a newbie-friendly open software project here. We’re excited to announce a new feature to come out of one of these mentorships. Thanks to Google Summer of Code intern Pratyush Singhal, the Dashboard now has a tool to help students and instructors find Wikipedia articles to work on. The Article Finder is available under the Articles tab on any Dashboard course page. The “Find Articles” button on the Articles tab takes you to the Article Finder tool. When you search a keyword in the tool, you’ll see a list of relevant articles. You can filter the results by quality, completeness, and how many page views the article receives per day. To maximize the impact of your contribution, we recommend that you look for articles related to your topic that are low quality, incomplete, or read by a lot of people. Search keywords in the Article Finder tool and see results sorted by an article’s quality, completeness, and daily pageviews. 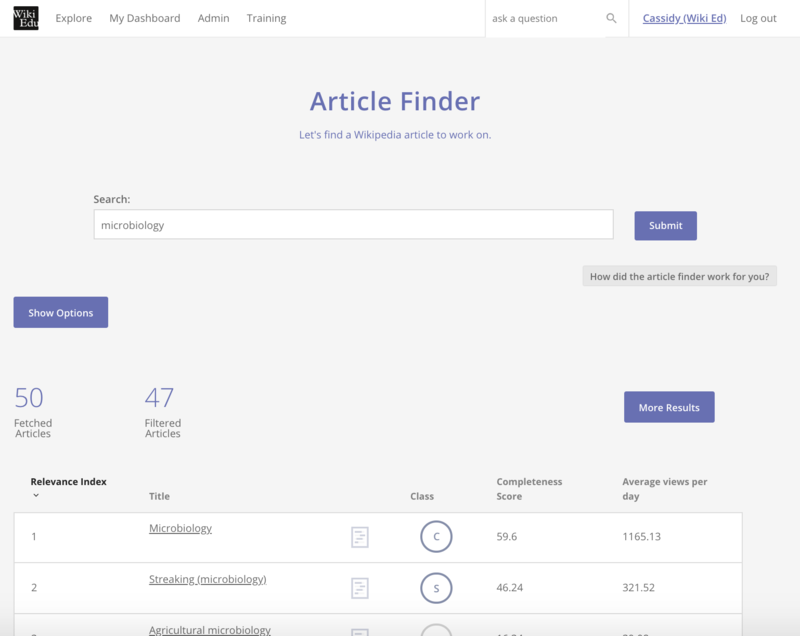 The Article Finder tool is useful both for courses in which instructors choose articles for their students to work on as well as those where the students are charged with finding topics themselves. For more in-depth guidance on finding articles, we’ve developed a training module for both instructors and students, that walk through the process in more detail. If you have questions or would like to learn more about the Dashboard, reach out to contact@wikiedu.org. Great tool, but you could significantly improve the readability/usefulness, and avoid teaching people that false precision (https://en.wikipedia.org/wiki/False_precision ) is acceptable, if you changed the last two columns. The figures those columns should be integers (and, ideally, had no more than two significant digits). For example, I did a search on “Radiology”. The first article listed has average views per day of 970.23. If it had 970.24, or 970.22, instead, would that make any difference to the reader? Obviously not, which means that there is at least one unnecessary digit. And it’s completeness score is 62.95; would the reader make **any** decision differently if the score were 63 instead? And, as is, it’s more difficult to mentally compare numbers – consider how a person would compare 2.22 versus 44. (It’s much easier to conclude that one number is roughly 20 times the size of the other if the numbers were 2 versus 44.) Or, for completeness scores – comparing two-digit numbers is much easier than comparing four-digit numbers (essentially, mentally, one has to discard the last two digits before getting to a meaningful comparison). Finally, ***alignment***. The numbers in the last column aren’t aligned; they should be. Thanks John! Good points. I’ve added issues for both the rounding and the alignment, and we’ll get them fixed soon I expect.